Apple co-founder Steve Wozniak quips Steve Jobs "came back reincarnated at Microsoft" referring to the Redmond-based company's recent design breakthroughs that have culminated in the new Surface, a tablet which sports a marriage of art and technology reportedly befitting of the late tech guru. 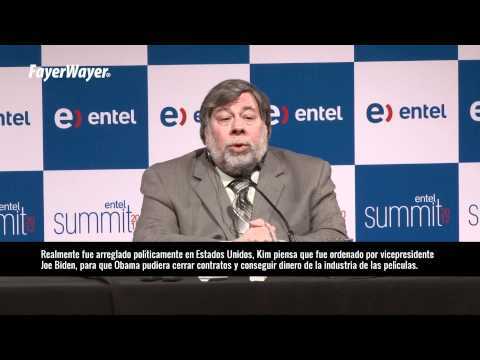 Wozniak made the comment during the 2012 Entel summit in Chile, reports Business Insider, and said he is eager to get his hands on Microsoft's latest device after seeing the company's significant strides in design with Windows Phone 7. "[Microsoft's latest products] have such a strikingly good visual appearance which is a lot of what Steve Jobs always looked for, the art and technology; the convergence of art and technology," Wozniak said. "And usually It was...visual appearance of things. So I made a joke that Steve Jobs came back reincarnated at Microsoft." Microsoft announced that it would be entering the tablet hardware market in June with the ARM-based Surface for Windows RT and the Intel-powered Surface for Windows 8 Pro. While industry pundits see the device as a possible iPad competitor, some OEMs are less than supportive of Microsoft's effort. Soon after Surface was announced, Acer founder Stan Shih balked that the tablet is merely a ploy to drum up interest for Windows 8 OS while computing giant HP reportedly scrapped its own plans to build Windows RT units. The reason for HP's alleged actions are unknown though some have speculated the company is reticent to enter a market where Microsoft would have a distinct pricing advantage as it would not have to pay for OS licensing. Last week Bill Gates said that Apple may need to create a Surface-like product of its own as the iPad simply can't compete with the versatility of Redmond's upcoming tablet which runs a more full-featured operating system than the stripped-down iOS. "I do want to see the Surface," Wozniak said, "I want to own one, I want use one but I prefer to judge things I really know and not just what I've read about. But I'm glad that Microsoft is, you know, starting to show that maybe they're a different company than before. I don't remember this sort of thing happening in a long, long time for Microsoft so I'm very happy." During the interview Wozniak also detailed his views on the future of sentient computing and recent legal developments relating to the Megaupload filesharing case and that company's flamboyant founder Kim Dotcom. Woz has some problems IMHO. No one ever accused Wozniak of having good taste. Wow. Does Woz have a grudge with Apple these days? It's one thing to say that Microsoft did a nice job, but this takes it to a whole new level. Speaking his mind, sans any silly brand-bias, is all that he's displayed time after time... Good Work Woz. 1. Why does Woz keep talking about technology as if he is relevant and influencing innovation? 2. Why do people keep quoting Woz as if he is relevant and influencing innovation? That's rich! I'm quite a fan of what MS we've seen from the Surface HW but everything MS is doing is the exact opposite of what Jobs did with Apple back in 1997. If Jobs were at MS he'd have not announce two versions of the Surface with two incompatible app architectures at the same time. He would not have released Metro as just another version of Windows. He would not have invited the press to see a demo of a product that wasn't even close to being ready or being truly tested by the tech industry. He wouldn't have shown his hand and then have no release date or price points. Steve Jobs just rolled over in his grave! What does Woz even do anymore? Apart from being an old face that's occasionally wheeled out for nostalgia? Exactly. Who the heck cares what Woz thinks? I've been asking the same question every month or so when AI posts another silly article telling us what phone Woz uses or what he thinks about something. What's next? His favorite brand of athletic shoe? Woz gets quoted because of his past connection to Apple and the fact that he says good things about brands other than Apple. And I appreciate that he appreciates all sorts of tech from all sorts of companies. He'll try out just about anything tech, regardless of brand - I assume because he's interested and can afford to do so. He comes off as being less biased that way. If I had the money, I would likely do the same. He is known to love just about all new gadgets; he can also afford to buy, use and collect every single electronics device that comes down the pike. I like his attitude just fine, but he definitely isn't a discerning critic. I believe Surface will hurt Microsoft so badly that Ballmer will depart in the next couple years. If it turns out great, it will be his saving grace. The likelihood of that happening, sadly, is quite low in my eyes. You need a surface to use the Surface. And that's worse than a MacBook Air. I find it ironic that Woz mentioned a couple of years ago that he would be open to any invitations from Apple if they were so inclined to try and employ him. I didn't think that Americans did irony? It IS nice in concept, speaking as a techie nerd. They’ve come up with some truly original and cool stuff. When/if it’s finished and fully working, will it be equally nice in reality? I hope so. Will it be AS nice as an iPad, and iPad’s app library? For most people, almost certainly not. But you have to start somewhere. Since it’s a future device and OS, not a present day device and OS, how will it fare against the future iPads and iOS versions that Apple releases? Apple’s not standing still. Hopefully they will push each other into better and better things. And you can compare to the MacBook Air, too. Is is Microsoft yet again making a “worse laptop” because they don’t “get” tablets? Will one of the Surface lines succeed while the other fails? How will they be priced? It will be interesting to see. I give MS credit where due, and so does Wozniak it seems. I don't think Woz has been quite right since the plane crash. Just ask Foursquare and see where he goes the most. I feel sorry for the man really. Seriously? What an insult. The fact that he references Apples MobileMe iDisk and then corrects with iCloud shows he doesn't use the service regularly. I feel like he backs Apple because of his history, not because of its future. He is out of the technology loop. He is no more in the know than any other consumer. I would like an iWatch or google glasses too but I cannot comment cause I don't own them either. People ask his opinion about stuff cause it was important once. Now he's just a regular consumer with enough money to buy the latest gadget.